Conservative commentator Ann Coulter canceled a speech planned for Thursday at UC Berkeley, but hundreds of supporters and critics nevertheless showed up. After days of widespread fear of riots in Berkeley over a planned visit from conservative commentator Ann Coulter, Thursday came and went with just a handful of arrests, little chaos, and no Coulter. Though Coulter never showed — she canceled her appearance Wednesday — several hundred people congregated on and near the campus of the University of California, Berkeley. The crowd included members of the alt-right, Trump supporters, and people on the political left who showed up to protest against the commentator and her supporters. 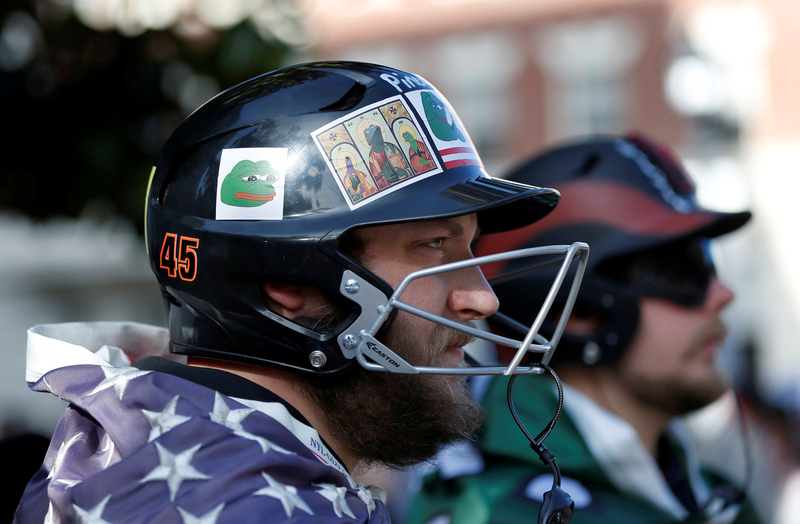 A man holds a sign showing Pepe, a frog meme that has been seized upon by the far right, during Thursday's gathering in Berkeley. By 6 p.m., four people had been arrested, according to the Berkeley Police Department. The university police also made two arrests earlier in the day, bringing the total to at least six arrests. Several of the arrests were captured on video by reporters at the scene. In one instance, police could be seen handcuffing a man on the sidewalk. Other arrests happened as people congregated in the street and police moved to corral the crowds. Police detain a person as they work to keep opposing protesters apart Thursday in Berkeley. But despite the handful of arrests, the gathering remained mostly peaceful. Though some attendees shouted at each other and journalists at the scene reported seeing a few threats of fighting, most of the crowd spent the afternoon listening to a series of speeches, milling around, and finally dispersing. Police also maintained a significant presence at the gathering, with officers in riot gear forming lines to keep various groups separate. Police in riot gear Thursday. The scene stood in stark contrast to other recent gatherings in Berkeley, which have erupted into violence and rioting. Just last week, for example, demonstrators from both the far right and the far left clashed in a large street brawl. And in February, a visit from conservative provocateur Milo Yiannopoulos prompted demonstrations that ended with far left protesters smashing windows, vandalizing buildings, and setting multiple fires. Many had feared a similar outcome during Coulter's visit. Coulter is a frequent talking head on Fox News, has long supported President Trump, and is famous for making incendiary right-wing comments. Demonstrators with opposing views argue Thursday in Berkeley. In the days leading up to Coulter's scheduled visit, UC Berkeley cited safety concerns and canceled the speech. Coulter, however, remained defiant and the school eventually reversed itself and said she could come. Finally, on Wednesday, Coulter said she would not speak at the school after all. After Coulter's announcement, some groups that had planned protests remained steadfast. Organizers of one Facebook event, for example, promised to "stand against xenophobic, bigoted language" whether Coulter appeared or not. 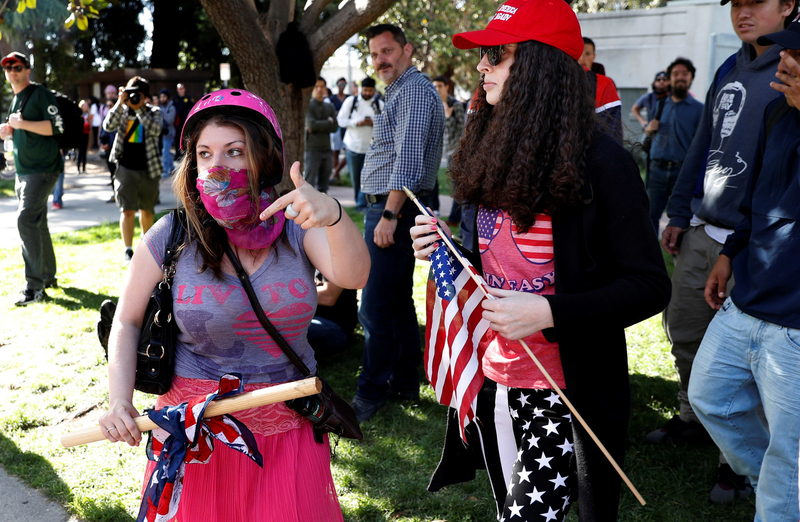 Others, from the political right, also showed up, holding pro-Trump signs, waving American flags, in some cases wearing helmets and other improvised riot gear. The crowds eventually swelled to several hundreds people, Berkeleyside reported. Significant violence never ultimately erupted, and some attendees expressed regret that Coulter never appeared.